he currency pair rallied on yesterday after Federal Reserve (Fed) Chairman Jerome Powell said in a speech that interest rates are just below neutral, suggesting fewer rate hikes were coming in 2019. The Fed chairman’s latest remarks compare to his October’s observation on rates, in which he said: “we’re a long way from neutral at this point, probably.” Powell revealed that the Fed is paying “very close” attention to economic data even as it expects continued “solid” growth, low unemployment and inflation near its 2% target. Some consolidation pre-Powell, but the broad Dollar still looks braced for further upside pending the tone of the FOMC head, with the USD index just off a 97.536 high for the midweek session (so far) and not too far away from its year-to-date best (97.693). Tax repatriation demand should in theory end today (spot month end), but the next SOMA day coincides with month end and November 30 may see residual buying for rebalancing needs. The preliminary gross domestic product (GDP) annualized in the US came in at 3.5% quarter-on-quarter in the third quarter of 2018, confirming the earlier figures. Upward revisions to non-residential fixed investment and private inventory investment were offset by a downward revision to consumer spending and a higher drag from net trade. New Zealand trade balance displayed an NZD -1,295 million trade deficit month-on-month in October, compared to the downwardly revised NZD -1,596 million gap registered in the previous period and falling analyst estimates of an NZD -850 million shortfall. It was the fifth straight monthly deficit, as imports jumped 14.1% year-on-year to an all-time high of NZD 6,154 million and exports rose at a softer 6.6% to NZD 4,859 million. Since the beginning of 2018 until last Wednesday close, the NZDUSD remains negative with a loss of over 3.0% but since the start of November rallied more than 5.0%. Nonetheless, since the beginning of the week, the currency pair remains advancing with in excess of 1.5% and on the daily time-frame, closed well in the green with a gain of 1.17%. Furthermore, the NZDUSD made a phase change, shifting from a recovery to an accumulation phase. On yesterday session, the currency pair rallied with a wide range and closed near the high of the day, in addition, managed to close above Tuesday’s high, which suggests a strong bullish momentum. The stochastic is showing a strong bullish momentum and crossed above the 50 midline. The currency pair ended October in a sideways correction but November started on the right foot by skyrocketing although now is trading within a daily resistance zone that ranges from 0.6801 up to 0.6896. Yesterday, Jerome Powell speech gave the NZDUSD a boost although it was not enough to break the daily resistance zone. 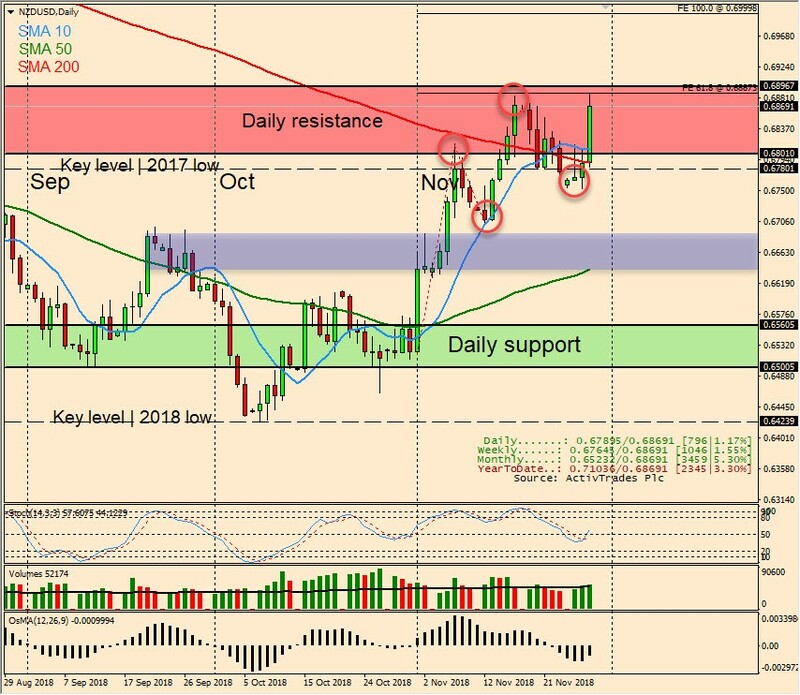 November price action shows a bullish trend revealed by the higher highs and higher lows and all points to a potential break of the daily resistance zone with a project target at 100 Fibonacci expansion near 0.7000. In the worst-case scenario, remains consolidation within a daily resistance zone that ranges between the 0.6801 up to 0.6896. Yesterday, the NZDUSD succeed in close above all three daily moving averages, the 10, the 50 and 200 that should provide dynamic resistance. Thursday, November 29 at 13:30 GMT (08:30 ET): The US Bureau of Economic Analysis is scheduled to release the Core Personal Consumption Expenditure – Price Index year-on-year in October, which is expected to come in unchanged at 2.0%, the same as the previous period. The “Core” excludes seasonally volatile products such as food and energy in order to capture an accurate calculation of the expenditure. It is a significant indicator of inflation. A high reading is positive for the USD, while a low reading is negative. Thursday, November 29 at 19:00 GMT (14:00 ET): The Federal Open Market Committee (FOMC) is scheduled to release its meeting Minutes, which are released by the Board of Governors of the Federal Reserve (Fed) and are a clear guide to the future US interest rate policy.